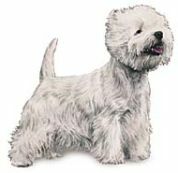 West Highland White Terrier - Very Popular, Charming and Opinionated Small Dog! The West Highland White Terrier, fondly known as the Westie, was developed in the highlands of Scotland over a hundred years ago. Its closest genetic relative appears to be the Cairn, while other highland terriers that were likely involved in its development, include the Scottish, Sealyham, Skye and Dand1e Dinmont. Credit is given to the Malcolm family of Poltalloch in Argyllshire for originally establishing the breed as we know it today. Apparently, after a reddish-colored Cairn terrier was accidentally mistaken for the fox and shot during a hunting event, Colonel Malcolm resolved to breed only for white dogs to prevent further sad mistakes. The Westie has a history as both a working and a hunting terrier. He was used on the farms and also in industrial settings to control the vermin. As a bold and hardy earth dog, the Westie has one of the best reputations for hunting fox, rabbit, otters and badgers among the cairns and rocks of the highland terrain. Today, this breed is a popular family pet and show dog. He is a very attractive and compact dog with a beautiful coat and a charming expression. His good looks have earned him quite a few gigs in advertising and television commercials. The Westie is a strong willed dog with a lot of confidence. For this reason, obedience training is advised to provide firm leadership and establish the owner's position as the boss. Consistency along with patience, but never harshness, will usually get the job done and they are considered to be quick learners. The West Highland White Terrier can best be described as mischievous and fun loving. He very much enjoys being around people and is generally friendly with other pets. Being very alert and prone to bark, he will warn of any outside disturbances. He also has a fondness for digging, so make sure your favorite landscaping is well protected. The West Highland White Terrier has a double coat, the topcoat being hard and quite long and the undercoat soft and furry. Grooming is needed about 2 to 3 times a week. A grooming tip is to apply cornstarch to the coat which when brushed out, will bring the dirt with it. With adequate grooming, Westies are low-odor dogs and shedding is about average. A daily walk of moderate length will meet the needs of this breed. An outside area for play is a good alternative for days when a walk is not possible, but make sure it is well secured as Westies still have very strong chasing instincts. They are quite energetic indoors most of the time. The West Highland White Terrier can easily adapt to any accommodations. They don't need a yard, but to have one is just a nice bonus and another venue for exercise. This breed does best with older children who are considerate and well-behaved around pets. No matter what the circumstances, it is always the best policy to have an adult supervising any activities between children and pets. The West Highland White Terrier loves companionship, is quite devoted to his owners, and has low exercise demands. As such, he is a good choice for the elderly or more sedentary family. New and experienced owners will find this book an invaluable resource. It will answer all your questions about Westies, everything from nutrition, house training, problem behaviors, to great advice for those pets with separation anxiety. And, because West Highland White Terriers are such handsome little dogs, you'll be delighted with the grooming tips to help you keep him looking good. Covers origin and early history both in England and the US, prominent American Westie kennels, breed characteristics, grooming and care, obedience, selection of a puppy, breeding, and advice about preparing a show dog. has a mind of his own.